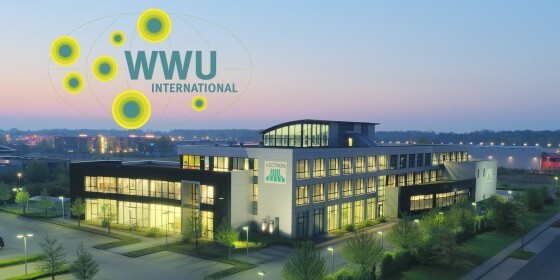 The University of Münster (WWU) is characterized in both its teaching and research by a wide diversity of international activities. Internationalization, though, is not an end in itself, but contributes to the profile and competitiveness of the University. 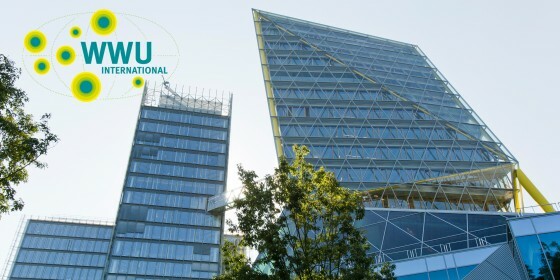 From October 2015 to May 2016 the press office of the University therefore devoted itself to the topic of “internationalisation”. 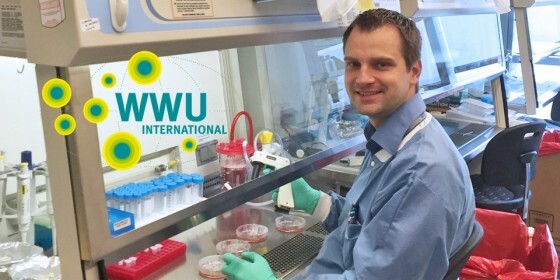 In the summer of 2015 Dr. Tim Sauer was still working as a senior physician in the field of bone marrow transplants at Münster University Hospital (UKM). Through the "Train-Gain" programme at the "Cells in Motion" (CiM) Cluster of Excellence at Münster University he funded an internship at Baylor College of Medicine in Houston. Should all courses be taught in English? Internationalization permeates Münster University at all levels. In order to attract even more of the best students from abroad, the University is offering more and more seminars, individual modules, lectures – even entire courses – in English. "Experience abroad – especially foreign language skills – are very important "
Münster University sees itself not only as being rooted in the local region, but also as having an international orientation – in teaching, in research, among students and among its administrative staff. Some students wonder whether international experience is an advantage for a later career. 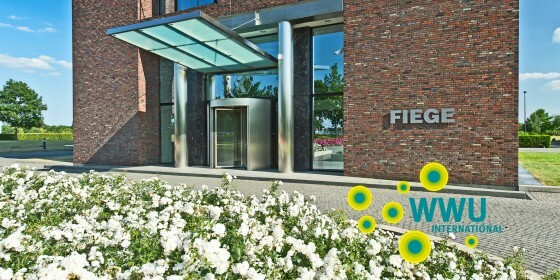 In this series of interviews, personnel managers from companies located in the Münsterland provide answers to these questions. Today: Ramona Kremer, employee at Vectron. 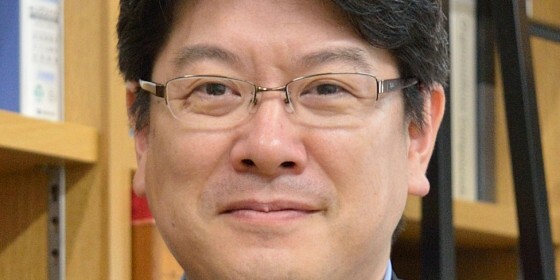 "Evidence of our international visibility"
It is a special honour for Prof. Armido Studer and his colleagues at the Institute of Organic Chemistry: Prof. Michinori Suginome from the University of Kyoto in Japan has chosen the Münster University Institute to spend a total of six months doing research. English is a must, German is a bonus! The list of his functions is impressively long and exudes internationality: President of the International Association for Germanic Studies from 2010 to 2015. President of the Shanghai Humboldt Club, to name just a few. 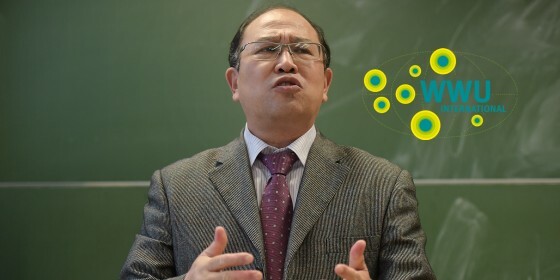 Some people also call Prof. Zhu Jianhua the high priest of German Studies in China. He shared his thoughts on native tongues and foreign languages in academic life with Juliane Albrecht when they spoke recently during his visit to Münster University. "Internationalization will become increasingly important in future"
Münster University sees itself not only as being rooted in the local region, but also as having an international orientation – in teaching, in research, among students and among its administrative staff. Some students wonder whether international experience is an advantage for a later career. In this series of interviews, personnel managers from companies located in the Münsterland provide answers to these questions. Today: Sonja Frühauf, personnel officer at Fiege. When Lei Guo and Tom Becker meet once a week to learn together, the result is a language mix of Chinese and German. Lei and Tom are just one of 140 such tandem couples that have got together in the winter semester of 2015/2016. The Language Centre has been offering this special type of course for German and foreign students at Münster University since the winter semester of 2007/2008. 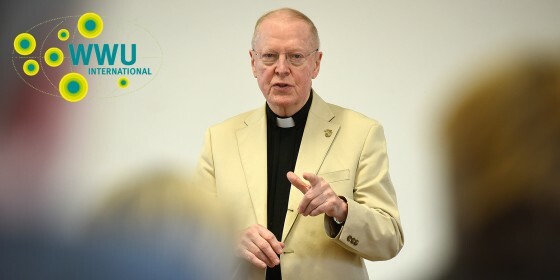 "In Münster I learnt about the priesthood"
It was at the invitation of the Center for German-American Educational History, headed by Prof. Jürgen Overhoff, that Prof. Leo J. O’Donovan, 81, returned to Münster University for a few days. Norbert Robers took the opportunity to talk to him. "We have high regard for international experience, although it is not an absolute requisite for us." Münster University sees itself not only as being rooted in the local region, but also as having an international orientation – in teaching, in research, among students and among its administrative staff. Some students wonder whether international experience is an advantage for a later career. In this series of interviews, personnel managers from companies located in the Münsterland provide answers to these questions. Today: Guido Hilchenbach, HR Manager at LVM Insurance. Why travel to distant lands? The Buddy Programme offers chances to enjoy international flair in Münster too / Record with 220 "Buddies"
Not everyone is able, or even wants, to spend time abroad – especially as not every course of study includes a compulsory semester abroad. And in any case: anyone who stays in Münster can get to know other cultures and bring the great wide world into their own homes – with the Buddy Programme. 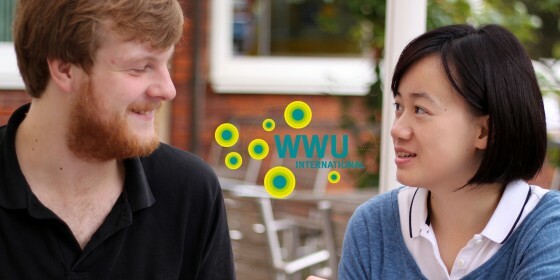 "We are always delighted to receive applications from people with international experience"
Münster University sees itself not only as being rooted in the local region, but also as having an international orientation – in teaching, in research, among students and among its administrative staff. Some students wonder whether international experience is an advantage for a later career. In this series of interviews, personnel managers from companies located in the Münsterland provide answers to these questions. 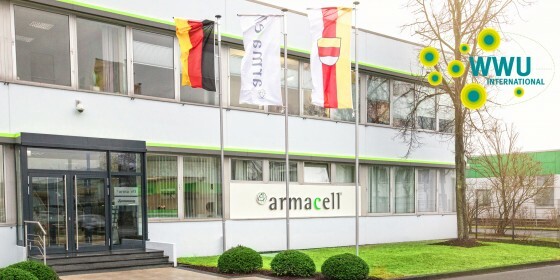 Today: Christof Heimlich, Personnel Manager at Armacell. "International experience is a positive criterion for recruitment." Münster University sees itself not only as being rooted in the local region, but also as having an international orientation – in teaching, in research, among students and among its administrative staff. Some students wonder whether international experience is an advantage for a later career. In this series of interviews, personnel managers from companies located in the Münsterland provide answers to these questions. 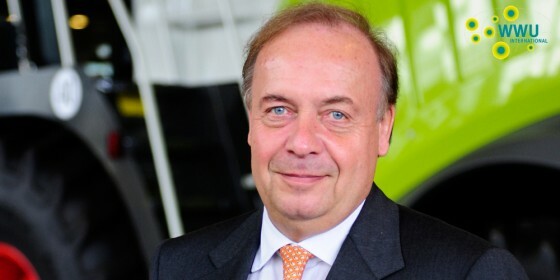 Today: Gerd Hartwig, Personnel Director at Claas. "The Humanities have always been pioneers to internationalization"
For ten years now Prof. Dr. Hans Beck, recipient of the Anneliese Meier Research Prize 2015, and his family have been living in Montreal, Canada, since he accepted the offer of a professorship at McGill University there in 2005. 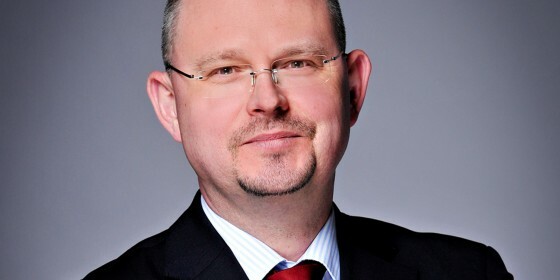 Juliane Albrecht spoke to Hans Beck about his life in the different academic worlds, and about the Research Prize designed to advance the internationalization of Humanities and the Social Sciences in Germany – and which occasionally brings him to Münster University. The Seasonal Celebration at Münster University was held under a Dutch flag this year. 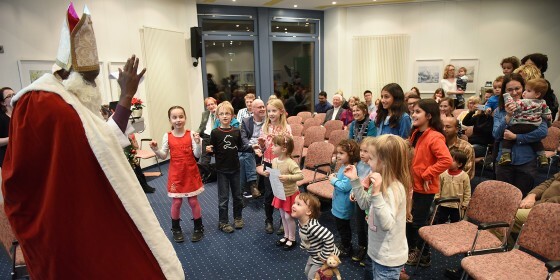 The International Office and the Centre for Dutch Studies organized the traditional Christmas and End-of-Year Celebration jointly, with invitations being extended to both international and German academics, families and friends. When Anita and Jonathon Watson, both 31, think back today to Erasmus, it has now acquired a completely new dimension for them. After all, it was the time that Jonny – as Anita calls her British husband – spent at Münster University that laid the foundations for their family with their first child. The new addition to the Watson family, who was born on 25. September, will also be treading European paths.